What a year it’s been for online video. Consumers are watching more and more content online, as the average user spends 67 minutes a day streaming. This is a large bump over last year’s 56 minutes, and marketers are taking notice. New research from eMarketer estimates that marketers are breaking spending records on video as Q4 2018 starts, and this growth is not expected to slow down any time soon. In 2018 alone, digital video advertising will grow by nearly 30% to a healthy $27.82 billion. That equates to just over one quarter of all digital ad spending this year, and Zenith forecasts that number to climb to $43 billion by 2020. The need to divert spending toward video should come as no surprise as people grow accustomed to consuming video on their own time and on the platforms and devices of their choice. Online video streaming is especially popular among younger consumers like Gen Zers, who average 4.2 hours per week streaming content, according to MNI Targeted Media. Gen Zers, more so than other generations, also don't mind seeing pre- or post-roll ads to learn about new products as long as the ads are relevant. As the members of Generation Z grow up, they and the generations that come after them are expected to further increase the volume of time that consumers spend watching videos. So where should you be moving your ad spend? Let’s dig into the eMarketer report to find out who is on which platform, and how much competition you’ll have to fight through to get your ad in front of your target audiences. Facebook is currently king when it comes to video, and with new features such as Facebook and Instagram Live increasing in popularity, it makes sense that almost 25% of all video ad spending (approximately $7 billion) in the United States will go to Facebook in 2018.
eMarketer forecasts that Facebook will continue to dominate spending on online video advertising through 2020. How do you get your piece of the Facebook video ads pie given the large amount of competition on the platform? One of the best ways is “in-feed” video. These ads build brand awareness and capture users’ attention, and segmenting your audience with granular demographics can help ensure that your ads are shown to the right people. There is a new format for video ads on Facebook too with Facebook Watch. In-stream Facebook Watch ads will function similarly to the ads you find on YouTube, and are projected to work well as users can compare it to commercials in standard television. Snapchat is the new kid on the block when it comes to video ads, and is projected to hit almost $400 million in video ad revenue in 2018. While spending on Snapchat video ads is not nearly as high as it is on Facebook, it is significant given the platform’s popularity with younger millennials and Gen Zers. That $400 million represents around 60% of Snapchat’s total ad revenue, showing the company’s heavy reliance on video ads as a driving force behind its profitability. It makes sense that SnapChat’s share of the market is projected to skyrocket in the next few years. Right now it accounts for 5.1% of all social video ad spend, and 1.4% of overall video ad spend in the U.S. 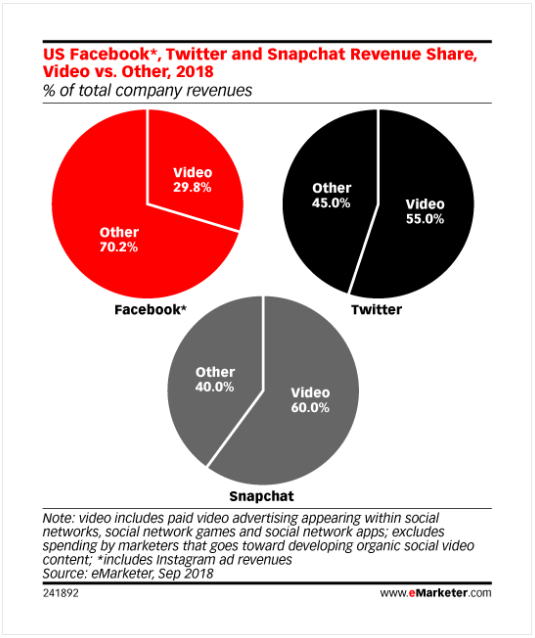 While Snapchat holds the smallest share of video advertising spend in percentage terms, it has one of the highest rates of growth, with spending increasing by 20% year over year. The point here is to get on board with SnapChat now while you can, as long as you are looking to appeal to a younger demographic. Whether or not your target audience is on the platform right now, odds are they will be pretty soon. More than half (55%) of Twitter’s ad revenue will come from video in 2018, and this is projected to grow by 12% this year to hit around $630 million. Twitter accounts for 8.1% of overall social video ad spending and 2.3% of overall total video ads, but the company’s share of video ad spend is expected to decline through 2020. While Twitter’s growth has declined in recent years, the platform is still popular amongst certain demographics. Because there is not heavy competition for video ads on the platform, it could be a good option if Twitter is popular with the audience you are targeting. No other platform has a bigger stake in the video ad space than YouTube. While Facebook has surpassed YouTube in terms of total video ad revenue, YouTube is still a force to be reckoned with, generating $3.36 billion in video ad revenue in 2018 alone. This is up 17.1% over last year, and video ads now accounts for a whopping 73% of YouTube’s total ad revenue. One of the main challenges YouTube faces compared with Facebook is how much they spend to get content. While Facebook doesn’t have to do much of anything to get users sharing content, YouTube spends over half of its gross revenue on content and user acquisition. With that being said, YouTube still represents a steady 11% of Google’s net US ad revenues. YouTube is a different beast for marketers. It is the go-to source for EVERYTHING video, so taking a stake in the game is a must if you are serious about reaching your audience with video. YouTube reaches more 18 to 49 year olds than any other broadcasting network, so your target audience is definitely here – along with all of your competitors. 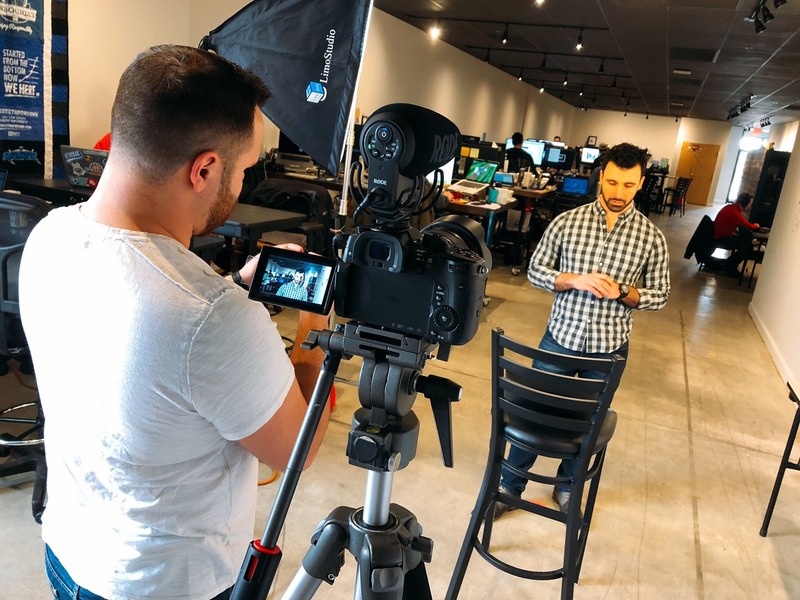 You’ve probably been hearing for years that your company needs to get started with video, but what’s more important is the content you create and how you get it in front of your audience. Understanding the differences between how social platforms deliver video to their users, as well as the audience demographics of each platform, can help you make the most of your video budget and ad spend. With some insight into how these platforms are performing with video and where they will be in the next few years, you can meet your audiences where they are to serve the best content. Is it True that Soon Not Everyone Will Be Able to Use Facebook Live?